This image is a carte de visite (visiting card) sized small albumen print photograph, taken in Paris while future Chicago architect Peirce Anderson was studying there, in the 1890s. William Peirce Anderson, 1870-1924, was known as Peirce or as Andy to his colleague peers. After his Harvard bachelor's degree, he completed two years of engineering coursework. At this time, he was encouraged by Daniel Burnham to continue his studies at the Ecole des Beaux-Arts, Paris. Anderson began in 1894 at the Atélier Paulin, soon passed the series of entrance exams to the Ecole des Beaux-Arts, and in two years, ca. 1897-99, won four prizes in the great art and architecture school. Anderson completed his degree in 1899, having become aquainted with many peers, including fellow diplôme receiver Edward H. Bennett and also French-born Ferdinand Janin. Both also worked with Anderson on the 1909 Plan of Chicago. Anderson's work in Burnham's firm included city planning in Washington, D.C. from 1901 to 1910 (train station, etc. ), when Bennett took the planning practice out of the Burnham firm. Yet Sally Chappell cites Graham (...Graham, Anderson, Probst and White, 1912-1936, U. of Chicago Press, 1992, p. 275) giving Anderson credit for later also selecting the sites for Plan related buildings such as the Wrigley Building (1919-24) and the Chicago Union Station (1913-25), along the Chicago River. Bennett's 1913-15 photo of the future site of Union Station appears to reflect collaboration here between the two, even if informal. 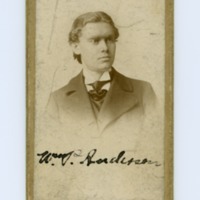 As Bennett's photos indicate, he knew Anderson well, as a student and then as a colleague after the older Ecole graduate led Burnham to engage this Englishman from the West. Chappell reports that "Anderson looked back on his years in Europe with his studies and his close friends as a golden period" (p. 274). Photographer is Chamberlin, a Paris photographer or photographic studio. Chamberlin, “William Peirce Anderson,” Digital Collections - Lake Forest College, accessed April 26, 2019, http://collections.lakeforest.edu/items/show/2088.